The tasting room at Dogpatch WineWorks. Photo from Facebook. Here’s a fun upcoming urban wine event: on Thursday July 26th head down Third Street to the ~DOGPATCH WINEWORKS~ for the Urban Winery Summer Sip tasting. Each attendee will get a flight of six Qualia wines. The wines are all from grapes grown in Sonoma County, but the wine was made on-site in the WineWorks space. The tasting will be paired with snacks from Gilberth’s Rotisserie, also in Dogpatch. Tickets are $15 in advance or $20 at the door. Dogpatch WineWorks is located at 2455 3rd St. at 22nd St., 415-525-4440. 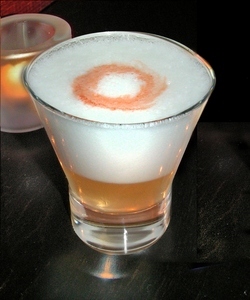 Pisco sour; photo courtesy of Pisco Latin Lounge. While numerous places will be viewing the 2012 London Summer Olympics in the coming weeks, you can kick off the festivities at ~PISCO LATIN LOUNGE~ when you get off work this Friday July 27th. Pisco will be viewing a replay of the opening ceremony starting at 7pm, with special cocktails, plus tapas and small plates. 1817 Market St. at Guerrero, 415-874-9951. You can do a double play the next day at Pisco (and neighboring ~DESTINO~!) on Saturday, which will be celebrating Peruvian Independence Day with $5 pisco sours all night long! SFoodie mentions ~LA MAR CEBICHERIA PERUANA~ will also be serving $5 pisco sours, plus cuy (guinea pig). Ay yi yi. 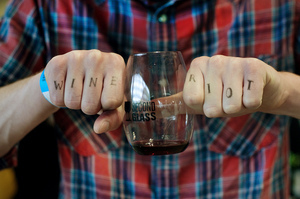 Temporary tattoos and cheeky wines at Wine Riot. Photo courtesy Wine Riot. On Friday and Saturday August 3rd and 4th, the national tour of Wine Riot will come into town for their frenzy of wine tasting fun. 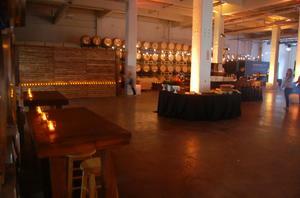 They’ll be taking over the Concourse Exhibition Center in SoMa for two days of wine mayhem. Winos in attendance will get access to more than 200 different tastes from more than 40 wineries, and it will all be poured alongside activities like making faces in a photo booth and 20-minute wine classes. There will also be a variety of food trucks offering nibbles to keep you going, and a DJ playing music all night. Worried about keeping track of it all? They have a free app to help you remember the wines you enjoyed so you can find them again later (read: when you’re sober). And, as a special for tablehopper readers, you can get $5 off your ticket price if you purchase by Friday July 27th. Just enter “tablehopper” at checkout in the promotional code box. With the discount, tickets for Friday night are $55, and Saturday afternoon and evening are $45. Friday 7pm-11pm, Saturday 1pm-5pm or 7pm-11pm. 635 8th St. at Brannan. The front dining room at Atelier Crenn; photo by Clement Hsu. This sounds straight-up fabulous. Go, if you can! On Thursday August 2nd, ~ATELIER CRENN~ will be hosting a winemaker dinner with Sean Thackrey, whose winery in Bolinas produces some pretty incredible and unusual pours. There will be five courses with five accompanying wines, including those from Thackrey’s study of Anderson Valley pinot noir, The Cassiopeia Project. It begins at 6:30pm with a Champagne reception, and the cost is $175, excluding tax and gratuity. Reservations can be made via email. On Wednesday August 8th, there will be another exciting winemaker dinner. This one will be at ~SAISON~, and the guest is Wells Guthrie of Copain in the Russian River. The menu will feature 12 courses from chef Joshua Skenes for $148. Wine pairings are an additional $108. 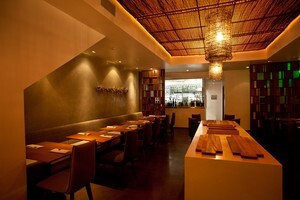 Seatings begin at 6pm, and reservations can be made by calling Saison at 415-828-7990.